At the request of those who couldn’t get in for the first show, Bop Shop Records wants to do it again! Celebrating the world-wide release of my new recording “Partly On Time - Unreleased Recordings 1968-1970” on Tompkins Square Records. Available on vinyl LP and CD. Limited Seating..first come-first seated. $10. A concert celebrating the world-wide release of my new recording “Partly On Time - Unreleased Recordings 1968-1970” on Tompkins Square Records. Available on vinyl LP and CD. Limited Seating. $10. Guitarist and Harp-guitarist Muriel Anderson was the first woman to win the National Fingerstyle Guitar Championship. I look forward to playing again with Muriel: dueling harp guitars? A taste of what’s coming up at the Woodstock Invitational Luthiers Showcase Oct. 26-28. It’s an honor to play with Michael. Mike rocks! I’ll be doing THREE HALF-HOUR SETS at 8:30, 9:30, and 10:30. show ends at 11 pm. “50 Years of Innovation in the Art of Guitar Building.” I’ll play the Opening Concert at 5:15 PM and the Reception from 6-7 PM. Michael Chapdelaine, Sean McGowan & Kinloch Nelson. We’ll share the night at Liberty House Concerts, York, ME. No advance tickets or reservations, but we appreciate an email letting us know if you are coming. info@woodpecker.com. We are joined by songwriter Lou Alano to discuss their journey to the harp guitar. No advance tickets or reservations, but we appreciate an email letting us know if you are coming. info@woodpecker.com. Don Ross & Calum Graham - I will host and open the show. Guitar Artistry Concerts. $15 advance; $18 day-of; Students with I.D. $10. $15; $5 student Tickets at http://www.madrigalia.org/tickets. Multi-instrumentalists Kinloch Nelson and Ben Proctor will play guitars and a gaggle of other instruments.Composers include Esenvalds, Paulus, Vaughan Williams, Dvorak, Stroope, Bob Chilcott, Rochesterian Phillip Silvey, British protest balladeer Ewan MacColl, and several new arrangements by Artistic Director Cary Ratcliff. w/guest artists Hee Sagong, violin and Susie Kieren, oboe. Sunday Musicale in Eastman�s Living Room. Come meet old friends and make new during this Advent tradition. I will be John and Joe Dady’s guest along with some other friends. Free will offering. Bob Sneider, Petar Kodas, Kinloch Nelson. Door at 7:30 PM. $15. $15 with Springville concert ticket / $20 without concert ticket. Workshop: ARRANGING FOR SOLO GUITAR: If You Can Sing It You Can Play It! Concert w/ John Sebastian, Happy Traum, Kinloch Nelson, Craig D’Andrea and Macyn Taylor. Promotional Concert for the Woodstock Luthier’s Invitational Guitar Festival. $45 Premier/$35 Reserved/$25 General Admission. Doors open 8 PM. $15. Kinloch Nelson�s Guitar Artistry series w/ Tim Farrell. I will open for Tim. BEST OF ECHOES 2010 award-winner. $15. for the family of Christian Monacelli, Pete and Gloria’s daughter. 9 Bands plus a silent art auction. $25 admission I will play from 7:30-8 PM. Friday evening “Sunset Wine Tasting” events feature live music with no cover charge. Wine by glass or tastings, or by bottle. Guests are welcome to bring light food...light food. Shawn Phillips-”The best kept secret in the music business”. $18 Adults, $10 Students. Anderson Alley, 250 N. Goodman St. You will be the first to see the unveiling of the location for Project Scion 2013! Wine...appetizers...and more! $12. Seating is limited to 30. Please contact Natalie Hebden to make your reservations: 603 544-2079. $10/person. Limited to 15 students for maximum student benefit. Materials & music provided. Please contact Natalie Hebden to make your reservations: 603-544-2079. Oct. 26-28 weekend. I will be playing mini-concerts for several acoustic guitar builders and teaching a workshop, “It’s All About Tone: The Attack and The Blossoming Note”. Muriel Anderson with Yours Truly opening. “Focus on Guitar Artistry” series continues. Up All Night presents David Bromberg, with Yours Truly opening. Guitar Workshop: It’s All About Tone! How to move from choice of a note to how and why to choose particular tones for the note. Java’s at the Market - Rochester Public Market, Union St.
“Words And Music Series”. Solo concert. Mark Arnold, FLCC guitar faculty, opening. Join Yours Truly, The Dady Brothers, the White Hots, the String Song Orchestra and others for a fund raising concert for Music Through the Ages. MTTA is a group of Rochester musicians and music-lovers who are carrying on the legacy of the late Dennis Monroe, local singer, songwriter, and teacher. MTTA brings music to under-served school kids, specifically at #19 School in Rochester’s southwest. Petar Kodzas, Bob Sneider and Kinloch Nelson will explore their individual musical roots with works written for jazz, classical, Latin, folk and modern fingerstyle guitar. I will be playing a Petros handmade guitar built from 100 year old redwood timbers. This performance will help raise funds for the Siskiyou Institute’s Artists-In-Schools Program. July 1-3 with AM and PM events. I will demo luthiers’ guitars in several miniconcerts and workshops. The Dady Brothers, the White Hots, the String Song Orchestra and Yours Truly, as well as others will be playing at a fund raising concert for MTTA. “10 Quality Acts” for $10 Donation - (more welcome if you can help the cause) - Cheap at Twice The Price! I will be a performer at Muriel Anderson’s All Star Guitar Night, Hard Rock Cafe, Ft Lauderdale. April 16-18: 3 days, 200 demonstration concerts by the “world’s best guitarists.” Yours Truly will be doing several demo concerts and workshops. 3 mi south of Bristol Mt, Naples, NY. Great menu. for live roots music in Central New York! The CAGED System and other tidbits. Palais des congrès de Montréal. Located right beside the site of the Festival International de Jazz de Montréal, it will offer fans and luthiers a bigger space, with all rooms and activities located on the same floor. 2001 National Fingerstyle Contest winner, Richard Smith, and Cincinnati Conservatory cello graduate, Julie Adams, are returning to Rochester for a show on Dec 11 2009 at The Tango Cafe, 389 Gregory St at 8 PM. Opening and hosting the show will be guitarist Kinloch Nelson. Richard Smith’s Travis/Atkins influenced guitar sensibilities find complementary and clever support from Julie Adams’ cello, which functions alternately as bass or melody, as the two run through vocal and instrumental arrangements of folk, ragtime, classical, and pop favorites. Here is a sampling of tunes they played last time they were here. Bye Bye Blackbird, A Little Bit Of The Blues, Windy And Warm, Jerry’s Breakdown, Stardust, A Thing Called Love, The Chet Shuffle, Tiger Rag, Mr Bojangles, Lady Madonna, She’s Leaving Home, If I fell In Love With You, Solace (from The Sting), Blackberry Blossom, Copper Kettle, Somewhere Over The Rainbow. For more on this duo you can find them on YouTube, or visit the Rochester Guitar Club website Articles Page www.rochesterguitarclub.com/articles (scroll to March 14,’09) . Thousands of amazing guitars and Accessories on Display for Sale. 108 Genesee St, corner Exchange St.
Ken Bonfield will also do a Presentation July 19 at Abilene’s for the Rochester Guitar Club on ‘The History of Fingerstyle Guitar in America’. 7 PM. Third right turn onto Townline road -- at stop sign stay straight ahead and it turns into Egypt road -- we are the fifth driveway on the left. 186 � Hampshire St., Inman Sq. Steve & Leslie Gretz host this house concert series. Call 585-413-0551 for reservations, limited seating. (more welcome if you can help the cause) - Cheap at Twice The Price! Government funding for The Arts continues to be curtailed and The Little, as a �not-for-profit� Rochester Landmark, is in danger of having to curtail some of it�s Music, Art and Independent Film programs. Music Through the Ages The Dady Brothers, the White Hots, the String Song Orchestra and Yours Truly, as well as others will be playing at a fund raising concert for MTTA. MTTA brings music to under-served school kids, specifically at #19 School in Rochester’s southwest. MTTA is a small group of Rochester musicians and music-lovers who are carrying on the legacy of the late Dennis Monroe, local singer, songwriter and teacher. ...Richard’s most prized guitar has written on it, �To my hero, Richard� -- signed Jerry Reed and Chet Atkins. Richard & Julie, husband & wife duo on acoustic guitar and cello, return for an encore of brilliant fingerpicking and beautifully arranged tunes. This is a night not to be missed. As well as playing some tunes, Muriel and I will talk with Open Tunings host Scott Regan. Limited Seating. Call 585-473-4300. 31 Wilshire Rd, Rochester NY 14618. Wilshire is off Winton Rd S. near Highland Ave. Doors open at 7:30 PM. Solo concert $5 members/$10 non-members. Solo Concert on The Petros Tunnel 13 Guitar I will be playing a Petros handmade guitar built from 100 year old redwood timbers. This performance will help raise funds for the Siskiyou Institute’s Artists-In-Schools Program. This guitar is built from redwood timbers salvaged from Ashland’s historic Tunnel 13 of the Siskiyou Train Lines and of “the last great American train robbery” fame. Guitarists take note: I will be performing on an instrument hand built by award winning luthiers Bruce and Matt Petros of Kaukauna WI. Petros Guitars picked up the coveted Players Choice Gold Award from Acoustic Guitar Magazine in 2008. The Siskiyou Institute is 501 ( c) (3) non profit arts organization located in Ashland, Oregon promoting Artists-In-Schools Program. HEALDSBURG GUITAR FESTIVAL ‘FINGERSTYLE SUMMIT’ Yours Truly � Tony McManus � Al Petteway � Laurence Juber � Vicki Genfan � Teja Gerken. Everyone welcome! Featuring a mesmerizing mixture of playing techniques and musical styles, 7 performers from the Healdsburg Guitar Festival are ready to take you on an exciting musical journey. Jazz, Fingerstyle, Old-Time, Classical, Blues, and beyond: there’s bound to be something for everyone! Stephen Bennett, Ken Bonfield, Giacomo Fiore, Vicki Genfan, Evan Hirschelman, Sean McGowan, and Kinloch Nelson�all featured artists at the 2011 Healdsburg Guitar Festival�have performed all over the world to great critical acclaim. The relaxed round-robin format means that some great stories and stage banter will enhance the music for the night, making this event a fitting conclusion for the Festival weekend. Free outdoor concert at Conesus Lake. Arrive early for best parking. Bring a blanket or lawn chair, relax and enjoy the sounds of summer! Outdoor concert series at the head of Consesus Lake. Bring a blanket or lawn chair. Kodzas/Sneider/Nelson: Guitars in the Round Petar Kodzas, Bob Sneider and Kinloch Nelson will explore their individual musical roots with works written for jazz, classical, Latin, folk and modern fingerstyle guitar. in So. Bristol, just down the road from Bristol Mt. $15. Ticket price includes copy of my new recording “KINLOCH Plays Tunnel 13 & other PETROS Guitars”. I recorded 8 unique handmade guitars made by award-winning luthiers Bruce & Matt Petros. Petros Guitars crafted many of these guitar tops from historic redwood salvaged from Oregon�s Tunnel 13, scene of the last �great� American train robbery. CAROLS AROUND THE WORLD The Lyric Chorale, featuring Conrad Susa’s “Carols and Lullabies: Christmas in the Southwest” with choir, harp - Barbara Dechario, marimba - Hannah Weaver, and classical guitar - Kinloch Nelson. Music Through the Ages Join Yours Truly, The Dady Brothers, the White Hots, the String Song Orchestra and others for a fund raising concert for Music Through the Ages. MTTA is a group of Rochester musicians and music-lovers who are carrying on the legacy of the late Dennis Monroe, local singer, songwriter, and teacher. MTTA brings music to under-served school kids, specifically at #19 School in Rochester’s southwest. Cancelled due to scheduling conflicts. Miche Fambro & Kinloch Nelson perform music while pop surrealist painter�Robert Cesarini pictures the music in progress.Robert’s painting will be raffled at the end of the show! ...a special Songwriters In The Round one-time summer show with Greg, the guitarist from the legendary Rochester band ‘Duke Jupiter’. Greg, who has been doing some acoustic rock songwriting lately, now lives in Austin, Texas. His singing and playing with Duke Jupiter was always smooth and confident, soulful with a dash of funk, southern rock attitude with a hint of jazz and always danceable. I am happy to be on board for this show and delighted Brian could run this special edition of SITR. Thanks also to Tango Cafe for making special arrangements to fit us in. I’ll be back at Tango Cafe continuing what has evolved into a focus on guitar mastery series. This time it’s with two fine classical guitarists, both Eastman graduates, now performing artists and professors in the classical guitar world. A night of original music and other material including music dedicated to, and discarded by, 20th-century guitar luminary Andres Segovia. Ed Gerhard with Yours Truly opening. Grammy Award winner Ed Gerhard performs on 6-string, 12-string, slide guitar and Acoustic Hawaiian Lap Slide. He captivates his audiences with virtuosity, generosity and sly humor. Known for his gorgeous tone and compositional depth, Gerhard can move a listener with a single note. ‘Gerhard does not write instrumentals. He writes songs only a guitar can sing’. $35.50 advance - $40 day of show. * This is a general admission SEATED Show. David emerged from a recording hiatus of 17 years with the solo, acoustic, traditional folk-blues album Try Me One More Time (Appleseed, 2007) which was rewarded with a Grammy nomination. For his 2011 follow-up album, Use Me, Bromberg chose a different approach, asking some of his favorite singer-songwriters and musicians to write (or choose), produce, and perform on songs tailored to his versatile skills as a guitarist and vocalist. Answering David�s call were well-known artists John Hiatt, Dr. John, Widespread Panic, Levon Helm, Linda Ronstadt, Los Lobos, VinceGill, Tim O�Brien & Keb� Mo� and the super successful record production team the Butcher Bros.
Muriel returns to Rochester as part of my series showcasing great guitar artistry. I will be playing mini-concerts for several acoustic guitar builders and teaching a workshop, “It’s All About Tone: The Attack and The Blossoming Note”. The Woodstock Invitational is an alternative guitar show, featuring contemporary, handmade acoustic guitars and stringed instruments, exhibited by their makers from around the world . It’s a “3 in 1 Evening” with Bob -jazz guitar, Petar -classical guitar, and Yours Truly -modern fingerstyle guitar. We will each play solo and then end the night having fun playing some tunes together. For those of you who love to see great quality live music but don’t want to be out late all night in a noisy bar, this series is perfect for you. A perfect compliment to your dining experience, and there is no admission charge at the door! Rosendale is located off I-87, about 70 minutes south of Albany, and 90 minutes north of NYC. The Rosendale Cafe offers some of the best vegetarian food and performing artists in the Hudson Valley. For reservations contact Natalie Hebden at 603-544-2079. Project Scion Studio Open House with music by Kinloch Nelson Anderson Alley, 250 N. Goodman St. You will be the first to see the unveiling of the location for Project Scion 2013! Wine...appetizers...and more! Let us thank those of you that supported Project Scion 2012. http://project-scion.org. Project Scion art and gear available to support Project Scion 2013. Join our raffle for great prizes! ...and more! Project Scion 2012: ‘The Orchard’ is at the corner of Jay & Child Streets. is a monthly citywide gallery night that encourages collaboration between non-profit, university, and commercial art venues in Rochester, NY. This initiative showcases area artists and arts institutions by promoting the First Friday evening of each month from 6-9pm as a community night for experiencing art. First Friday ensures a healthy art scene and a healthy city through regular exchange and discussion between venues, artists and patrons. First Friday Rochester was initiated, and is administered by Rochester Contemporary Art Center. YoursTruly opening for Shawn Phillips Shawn Phillips-”The best kept secret in the music business”. $18 Adults, $10 Students. The 7th annual Ontario Barn Festival will be held Saturday, August 31, 2013 from 1 pm to 8 pm. The festival will feature all day live music, BBQ, arts & crafts, promotion of solar energy, apple picking, free ice cream and face painting and lots of fun! Bring the entire family! Film/Music/Design/Ecofest celebration of all things green. Sept.10-15, 2013. High Falls district and other venues around Rochester, NY. Greentopia | ECOFEST will offer a wide variety of things to see and do including speakers, green vendors, a farmer�s market, how-to�s, an alternative fuel vehicle show, a kids� zone, a fashion show featuring garments made from recycled and upcycled materials, wine and beer tasting, music, organic food, and most importantly, fun! Greentopia | ECOFEST is your one-stop destination for a weekend like none other. A celebration of all things green, Greentopia | ECOFEST will offer a wide variety of things to see and do including speakers, green vendors, a farmer�s market, how-to�s, an alternative fuel vehicle show, a kids� zone, a fashion show featuring garments made from recycled and upcycled materials, wine and beer tasting, music, organic food, and most importantly, fun! Event organizers say, ‘enjoy this show, have some wine, then take your partner out for dinner at 7:30.’ Ontario Barn Vineyards is open every Saturday and Sunday from 12:00 noon to 5:00 pm through December 22, 2013. The Big Heart Monacelli Benefit Concert for the family of Christian Monacelli, Pete and Gloria’s daughter. 9 Bands plus a silent art auction. I will play from 7:30-8 PM. We’ll have some tables, and there is a lawn to picnic on. Please bring food & drink & children if you like. Reunion Concert with Walt Atkison and Bernie Heveron Doors open 6:45. $10. �� Joining Atkison will be long-time cohorts: noted bassist Bernie Heveron and guitarist Kinloch Nelson. Kinloch Nelson�s Guitar Artistry series w/ Tim Farrell. I will open for Tim. BEST OF ECHOES 2010 award-winner. $15. Tim will do a Guitar Workshop “Song Arranging on Fingerstyle Guitar” Sunday, Oct. 5 at 3 PM at Bernunzio’s Uptown Music. $20. If Concert and Workshop are purchased together there’s a $5 discount. http://www.timfarrellmusic.com. Aa frequent first place winner of the Annual International Acoustic Music Awards Tim’s music receives regular airplay on Broadcast Radio, Satellite Radio, Internet Radio, In-Flight audio, podcasts, etc ... Tim’s most recent album CODAS was voted BEST OF ECHOES 2010 in the Listener’s Poll. You might have heard him already and didn’t know it�Tim has written music for TV and radio shows, multi-media presentations, movie soundtracks, websites and interactive theater productions. Listen for Tim’s music in the films “Small Small Thing” and “The Missing Piece” both currently showing at film festivals internationally. Kinloch Nelson�s Guitar Artistry series w/ Award-winning Canadian guitarist Don Alder $15. Don will teach a guitar workshop on Saturday Oct 18 - On The Subject Of Tone -. Lehmann Strings, 34 Elton St, Rochester, NY. 2 - 4 PM. $20. Call 585-461-2117 for reservations. Don won Guitar Idol III in London, UK Dec 4 2011. He is the only guitarist in the world to win all 3 major fingerstyle guitar competitions: 2007 International Fingerstyle Championships, 2010 Guitar Player Magazine Guitar Superstar Competition, and the 2011 Guitar Idol (London,UK). Concert w/ John Sebastian, Happy Traum, Kinloch Nelson, Craig D’Andrea and Macyn Taylor. Promotional Concert for the Woodstock Luthier’s Invitational Guitar Festival. $45 Premier/$35 Reserved/$25 General Admission. Workshop: ARRANGING FOR SOLO GUITAR: If You Can Sing It You Can Play It $15 with Springville concert ticket / $20 without concert ticket. Solo concert Second in a series of Acoustic guitarists. 2-4 PM Workshop: ARRANGING FOR SOLO GUITAR: If You Can Sing It You Can Play It. $15 with concert ticket / $20 if no ticket for the concert. I’ll be joining musical forces with Steve Hahn in my Guitar Artistry Series for a concert featuring harp guitar, baritone guitar, and the groundbreaking Chapman Stick - a full range electric instrument played for the most part with hammering techniques. There are comparatively few experts on this instruments and Steve is one of them. Guitars in the Round -Sneider/Kodzas/Nelson Bob Sneider, Petar Kodas, Kinloch Nelson. Door at 7:30 PM. $15. Bob Sneider, jazz guitar and Petar Kodzas, classical guitar will join me for an evening of musical cat and mouse. The Dady Brothers & Friends Advent Concert Come meet old friends and make new during this Advent tradition. I will be John and Joe Dady’s guest along with some other friends. Free will offering. Solo concert Sunday Musicale in Eastman�s Living Room. Free with tour admission (free to members). Contact Kathy Connor, kconnor@ghs.org. Hours : Tue - Sat : 10am - 5pm . Sun : 11am - 5pm. A quiet evening of music and wine tastings. $35. Limited tickets, contact The Red Door Inn for details at (585) 394-0455. Libation by Twisted Rail Brewery and Arbor Hill Winery. Billy is a Woodstock, NY-based fingerstyle guitarist. Steeped in the music of Michael Hedges, Leo Kotke, Keller Williams and Kaki King, Rogan’s playing with its shifting rhythms, aggressive technique and colorful touch brings a refreshing approach to acoustic guitar music. http://www.billyrogan.com. $15. 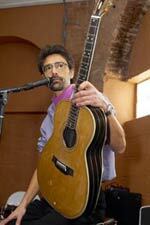 Billy is a Woodstock, NY-based fingerstyle guitarist. Steeped in the music of Michael Hedges, Leo Kotke, Keller Williams and Kaki King, Rogan’s playing with its shifting rhythms, aggressive technique and colorful touch brings a refreshing approach to acoustic guitar music. http://www.billyrogan.com. $12. Kinloch Nelson and Matthew Cochran - Guitar Artistry Series w/guest artists Hee Sagong, violin and Susie Kieren, oboe. w/ Madrigalia Choral Ensemble “Songs of Home and of Exile” $15; $5 student Tickets at http://www.madrigalia.org/tickets. Multi-instrumentalists Kinloch Nelson and Ben Proctor will play guitars and a gaggle of other instruments.Composers include Esenvalds, Paulus, Vaughan Williams, Dvorak, Stroope, Bob Chilcott, Rochesterian Phillip Silvey, British protest balladeer Ewan MacColl, and several new arrangements by Artistic Director Cary Ratcliff. What is ‘home’, and what does it mean to leave it, look for it, return to it? Songs from Finland, Armenia, Hawaii, and ‘The Oklahoma Hills’ (Woody Guthrie) express love for one’s place of origin. Madrigalia will perform songs from Czech and Latvian composers, from an Irishman who sets his sights on Canada, and from Georgian POWs reminisce of home, ‘where they shot their first arrows’, as well from Australian Aborigines, Sudan, Latvia and America. Enjoy the beautiful setting plus wine and cheese and/or bring a picnic. Less than half hour drive from Rochester. Don Ross & Calum Graham - I will host and open the show. Guitar Artistry Concerts. $15 advance; $18 day-of; Students with I.D. $10. Don is a one-man band tour de force, and the only one in history to have won the International Fingerstyle Guitar Championship twice. Calum Graham, who cites Don as being one of his biggest influences, was the youngest competitor to win the Canadian Guitar Festival Fingerstyle Championship (2010). On their own they are some of the grooviest and most melodic of the modern fingerstyle players, and together are more than the sum of their parts - as evidenced by their duet release from 2013 titled “12:34”. bring their own instruments, tuners, capos, any permitted recording devices, etc. WORKSHOPS for full clinic descriptions and instructors info. Ginny Miller, piano; Lynda Dimitroff, cello; Susan Kieren, oboe, will join us as well as Cecile Saine, Carol Dady, Rose Dady, and John Moonan on vocals. Come celebrate with all of us! $15. Advance tickets are $12. Contact julie@bernunzio.com or call 473-6140. Reservations suggested. Doors open at 7:30 PM. American fare featuring the best of the Finger Lakes bounty, served in a casual dining atmosphere - seasonal, local specialties. Wines from Inspire Moore Winery plus a large beer selection. Yours Truly and Harvey Reid share the night No advance tickets or reservations, but we appreciate an email letting us know if you are coming. info@woodpecker.com. Catch some music, and enjoy the beaches, cool breezes, surfing, seafood and hospitality of this popular summer resort. You can contribute $10, $20 or $50 using PayPal at http://www.woodpecker.com/uberlocal/, or donate at the concert as you wish. Fandango at the Tango concert series. $10 suggested donation. Lite Fare & Appetizer Menu, Full Bar, Espresso, Cappuccino, Lattes, Coffee and MORE! We proudly support local businesses and are now offering two “hand crafted” whiskeys from the Iron Smoke Whiskey Distillery in Fairport, NY. Guitars-In-The-Round concert kicking off the SBAIC Festival featuring a wide variety of today’s modern fingerstyle guitar. $12 in advance with priority dinner seating. $15 at the door. Open to all! 14th Harp Guitar Gathering Open to ALL! No need to play/own a harp guitar. Open to ALL! No need to play/own a harp guitar! Instruments available for sale, to try, and to borrow. 6-string guitar players and other musicians and lots of non-musicians come to listen, learn, socialize and explore our world. We hope you will join us as well! The Harp Guitar Gathering� is a weekend event, featuring two public concerts and a series of activities for registered participants. The concerts feature world class harp guitarists of many styles from around the globe, and are open to anyone, with individual tickets sold in advance and/or at the door. KN & Dan Schwartz: Harp Guitar Converts We are joined by songwriter Lou Alano to discuss their journey to the harp guitar. Tickets $15 advanced, $18 day of, and $12 students. I�ll join Lynda, cello, Susie Kiernan, oboe, Ginny Miller, piano, and John & Joe Dady on guitars and fiddle. SSJ Motherhouse, 150 French Rd, Pittsford NY. Kinloch Nelson and Harvey Reid We’ll share the night at Liberty House Concerts, York, ME. Weekly private concerts in our awesome 1880’s Carriage House in York Village, Maine. There is no admission charge. You can contribute $10, $20 or $50 to our cause on the website, or donate in person at the concerts as you wish. 70-seat concert venue in our private 1888 carriage house. No admission charge, but you can contribute $10, $20 or $50 to our cause on the website or donate in person at the concerts as you wish. SBAIC Festival - Opening Dinner Show Michael Chapdelaine, Sean McGowan & Kinloch Nelson. Guitar Summit & Festival Opening Dinner Show $12 in advance with priority dinner seating. $15 at the door open to all! Demo concerts, Guitar Clinic 1:40 PM-Klein Guitars. 2:20 PM-Singing Strings Guitars. I’ll play the Opening Concert at 5:15 PM and the Reception from 6-7 PM. � Artisan presentations from 1:00-6:00 pm. A daylong symposium on�contemporary and traditional�craftsmanship. Live radio show hosted by Phil ShapiroWVBR’s Bound for Glory, broadcast live from Anabel Taylor Hall I’ll be doing THREE HALF-HOUR SETS at 8:30, 9:30, and 10:30. show ends at 11 pm. WVBR’s Bound for Glory, broadcast live from Anabel Taylor Hall at Cornell University and still hosted by original host Phil Shapiro is North America’s longest running live radio folk concert broadcast and on the air since 1967. Longest running live radio folk concert broadcast and on the air since 1967. 50 Years of Innovation in the Art of Guitar Building. Concert at 7:30pm. This is the final day of The Klein Community’s comprehensive exhibit of unique Steve Klein Guitars. Tickets from $25 to $75. The venue is handicapped accessible. Tickets available online. Follow the bouncing ball (melody by the numbers)� This workshop approaches fingerboard study through the playing of melody: first on one string, then on multiple strings. Scales, chord shapes, multiple note positions are reviewed to provide context. Fingerboard mapping, octave grids and lines of redundancy, points of reference (position markers and root strings), scales and solfege, all leading to comprehensive understanding and total fingerboard familiarity. Handout materials to include songs, fingerboard graphics and other information. Bring a guitar, in tune. Recording permitted. Level: Beginner, Intermediate. Music curated by Kinloch Nelson with performances by WILS participants, remaining luthiers, local notables and special guests; M.C. Norm Wennet. This is the complete show for guitar and music lovers and includes guitar makers, a concert series, master classes, and historic guitars. An opportunity for music lovers, musicians, students, guitar enthusiasts, and luthiers alike to experience the finest handcrafted guitars in the world and their makers. The Rabbit Room restaurant at the Lower Mill uses the freshest ingredients available with an art-inspired setting, in a historic gathering place. 20 minutes from Rochester in Honeoye Falls, NY. - one of Western New York’s most unique meeting and event spaces. Now serving lunch Thursday - Saturday, from 11:30 AM - 2:00 PM. Dinner and Live Music Thursday nights only. An annual event celebrating the instrument known as the harp guitar, as well as its players, builders and history. It is hoped that musicians, luthiers, scholars and fans alike will participate in and benefit from the synergy resulting from ‘gathering’ together for this purpose. Concert - Michael Chapdelaine and Yours Truly A taste of what’s coming up at the Woodstock Invitational Luthiers Showcase Oct. 26-28. It’s an honor to play with Michael. Mike rocks! 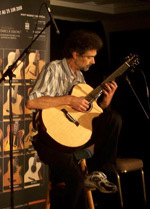 Michael Chapdelaine is the only guitarist ever to win First Prize in the world’s top competitions in both the Classical and Fingerstyle genres; the GFA International Classical Guitar Competition and the National Fingerstyle Championship. He has twice won the coveted NEA Solo Recitalist Grant, and took First Prize in the Music Teachers National Association Guitar Competition. He also won the Silver Medal in Venezuela’s VIII Concurso International de Guitarra “Alirio Diaz”. His Sonata Romantica CD, (now re-released as “Mexico”), is considered one of the definitive recordings for the instrument. Acoustic Guitar magazine wrote ��I have seldom heard a more beautiful album. Other young guitarists have excellent technique, but few have such style and musicality, and Chapdelaine’s beautiful tone is the nearest to Segovia’s that I can recall.” Michael is Professor of Music and head of guitar studies at the University of New Mexico. His teachers included the great Spanish maestro Andres Segovia. Music is the straw that stirs the drink at this Cheers-meets-Austin club. ROCHESTER�S HOME OF ROOTS MUSIC SINCE 2008. Doors open 4 PM. Muriel Anderson w/ Yours Truly Guitarist and Harp-guitarist Muriel Anderson was the first woman to win the National Fingerstyle Guitar Championship. I look forward to playing again with Muriel: dueling harp guitars? Her recent video of �Why Worry� on 20-string harp guitar garnered over 8 million views online. New Record release Concert, ‘Partly On Time’, on Tompkins Square Records A concert celebrating the world-wide release of my new recording “Partly On Time - Unreleased Recordings 1968-1970” on Tompkins Square Records. Available on vinyl LP and CD. Limited Seating. $10. Tompkins Square Records (San Francisco) is releasing my latest record - or maybe my oldest record - on CD and on vinyl in late March, and I am celebrating with a Vinyl/CD release concert at The Bop Shop. The songs on this record go way back: 50 years - half a century. They are from from my early days of exploring guitar playing. They were what we called fingerpicking instrumentals back then, and in a style that some folks in the music industry are now calling American Primitive Guitar. Think John Fahey, Sandy Bull, Davey Graham. Hence the interest the record company took in the recordings - their pre-Leo Kotke vintage and their sonic patina. There are 12 songs - all originals, and all from the original recording tapes they were made on. Some of them may be familiar to you since I still play a few of them today. I’ll be playing these and undoubtedly a few others from those days. encore Record release Concert, ‘Partly On Time’, on Tompkins Square Records At the request of those who couldn’t get in for the first show, Bop Shop Records wants to do it again! Celebrating the world-wide release of my new recording “Partly On Time - Unreleased Recordings 1968-1970” on Tompkins Square Records. Available on vinyl LP and CD. Limited Seating..first come-first seated. $10. There are 12 songs - all originals, and all from the original recording tapes they were made on. Some of them may be familiar to you since I still play a few of them today. I’ll be playing these and undoubtedly a few others from those days. Come and celebrate with me! we are doing the next night at Daily Perks Coffehouse. On the air with host Tim Stone. Concert & Interview. This will be webcast at www.WSCA FM.org. 40 miles WSW of Albany. With Larry Sugarman. This is a CD release party for Larry's new recording. Larry will no doubt be psyched after just playing a concert on the banjo at the Corcoran Art Gallery in Washington DC where there is an exibition on the banjo and its history. Concert and interview w/ Kathy Johnson and yours truly on the Scott Regan show "Open Tunings"
New England Folk Festival -in The Chorus Room. mini concert: "Just Guitar, No Words"
Guitar instrumentals of a thematic nature. Geoff Bartley�has been running this singer/songwriteropen mic since 1991. His guests over the years have included many well known� musicans. of this long running open mic.�Geoff starts the night at 8:00 pm with a short set. stopping in for sometime, too. www.geoffbartley.com�� Follow links for "Geoff at the Cantab/Monday Night Open Mike"
Solo with talk show host Chris Darling. Chocolate addicts: need I say more? Another evening of who knows what will happen next with Phil Marshall, Scott Regan and yours truly. This weekend-long (August 4,5,6) bi-yearly festival features hundreds of handmade guitars by many of the nation's great luthiers. It is the same weekend as The Newport Folk Festival. I will be performing on Bernie Lehmann guitars, Sheldon Schwartz guitars and Peter Hopkins guitars. The workshop will be on different approaches to understanding the layout of the fingerboard. There is a full description of this workshop, other workshops, concerts and the participating luthiers and the events schedule on www.newportguitarfestival.com. Jeff and I are old college chums where we had a once-a-year band for about 12 years.�Hmmm...maybe we'll play some of that material.��At any rate some of Jeff's credentials include studies at Eastman Music School, an appearance with�The Rochester Philharmonic (on banjo, no less), touring as the bassist/guitarist with the Paul Winter Consort, and more recently in the TV world�scoring music for NOVA, As the World Turns,�Another World, The Guiding Light, and Friends. 3 miles south of Bristol Mt. Local guitar luthier, Bernie Lehmann will host a concert and open house on the 2nd & 3rd floor at Lehmann Stringed Instruments, 34 Elton Street.�Featured will be NYC jazz guitarist Rodney Jones, local gypsy jazz group Lumiere, Eastman Music School's classical guitar professor Nicholas Goluses, local Latin American music group Los Arpegios, and yours truly acting as MC.�I'll open the show with a few songs...how could I not?�Come by at 11 AM for a couple hours of refreshments and guitar talk and whatever jamming may take place. Sat Jan 29 Daily Perks Coffee House, 389 Gregory St, Rochester, NY. off Paul Rd in Chili, NY, solo, 8-10pm. with blues and ragtime guitarist and singer Fred Vine, 8-11 pm, $6. Sun Apr 3 The Dolphin Striker 15 Bow St, Portsmouth, NH. 8 pm. Mon Apr 4 WSCA Fm 106.1, live, Portsmouth, NH. April 8, 9,10 New England Folk Festival, Natick MA. and a workshop Sat 12 noon on alternate guitar tunings. with folksinger/music historian Allen Hopkins - traditional folk and more. Sat May 14 Paradigm Cafe, E Henrietta Rd, Rochester NY. 8 pm. Fri May 20 Daily Perks Coffee House 389 Gregory St, Rochester, NY. Company, 63 Main Street, Canaseraga, NY. 8pm. off Paul Rd, Chili, NY. solo. 8-10pm. Craft Company No.6, 785 University Ave., Rochester, NY. Sat June 11 Clarence Center Coffee Company, Clarence, NY. Fri June 17th Daily Perks Coffee House 389 Gregory St. Rochester, NY. "JazzStreet" stage (Gibbs St. fronting Eastman Music School). Fri June 24th Atwater Park with singer/songwriter Maria Gillard. Sat June 25th Daily Perks Coffee House, 389 Gregory St.,Rochester, NY. Chili, NY. solo. 8-10 pm. Fri July 22 Daily Perks Coffee House, 389 Gregory St., Rochester, NY. Sun July 31 The Dolphin Striker,15 Bow St, Portsmouth, NH. Marriott Hotel, Providence, Rhode Island (Aug 17-22). Concert - Sat Evening RISD Auditorium. Sun Aug 21 House Concert Hampton, CT. Contact melmack2@gmail.com for directions & reservations. Pot luck lunch and concert in the barn. Tues Sept 6 Club Passim, 47 Palmer St, Cambridge, MA. Fri Sept 16 Rochester Artisan Works, 565 Blossom Rd., Rochester, NY. Sun Sept 18 The Dolphin Striker, 15 Bow St, Portsmouth, NH. opening for Leon Redbone. 8 pm. Check website for location. www.guitarleague.com. Sun Oct 23 Lehmann Guitars Concert SPECIAL EVENT! "Bernie Lehmann's Handmade Guitars Give A Concert"
This event was such a big hit a few years ago we decided to do it again. instruments. Folk, Blues, Jazz, Classical, Latin, Country, and more! Many local musicians contribute their fine talents. www.lehmannguitars.com. Sat Oct 29 Harmony House Heartland Concerts, 58 E. Main St.,Webster NY. Opening for Eric Garrison. 8 pm. SAT JAN 31 Daily Perks CoffeeHouse, 389 Gregory St, Rochester, NY. Monthly Series. solo. Guest artist Dennis Monroe. 8 pm-11:30 pm. SUN FEB 15 SPECIAL EVENT! At Daily Perks CoffeeHouse, 389 Gregory St, Roch. 2pm- 'til ? SAT FEB 21 Daily Perks CoffeeHouse, 389 Gregory St, Rochester, NY. Jerry Preston & bassist Chuck Bianchi. 8 pm-11:30 pm. Cover. THU FEB 26 The Press Room, 77 Daniel St, Portsmouth,NH. SOLO. 9 pm. SAT FEB 28 Cafe Noir House Concert series, 52 Green St, Augusta, ME. SOLO Concert at 8 pm.Contact mrtinswngr@aol.com or 207-626-0165. SAT MAR 13 The Center for the Arts in Natick,14 Sumner St, Natick, MA. OPENING (SOLO) for Spider John Koerner. www.Continentalcafe.net. 978-263-2233. $5. 11 am-2 pm. SAT MAR 27 Daily Perks CoffeeHouse, 389 Gregory St, Rochester, NY. Monthly Series. solo. w/ acoustic blues player Fred Vine. $6. 8 pm. FRI APR 9 The Coffee Bean Cafe, 3268 Main St, Buffalo, NY. with singer/songwriters Mari Anderson and Stu Shapiro. SAT APR 10 Zamar Cafe, 15 E Main St, Webster, NY. solo No cover. 5-7 pm. Rochester, NY. solo. No cover. 9:30 pm. THU APR 22 The Press Room, 77 Daniel St, Portsmouth, NH. www.Continentalcafe.net. 978-263-2233. $5 suggested. 12 am-3 pm. Open Mic. I'll be sharing the Feature with Allen Hopkins. Venue & pm time TBA. Inquiries www.ellenschmidt.com. FRI APR 30 Daily Perks CoffeeHouse, 389 Gregory St, Rochester, NY. instructor Petar Kodzas $6. 8 pm. SAT June 5 Episcopal High School school function. FRI June 11 Same day...but at night. W. Acton Center, MA. Saturday Brunch Concert. solo 12 am-3 pm. The Newport Guitar Festival, Newport RI. See website for schedule & other information. FRI August 20 Daily Perks Coffee House, 389 Gregory St, Rochester NY. Monthly Series with guitarist Norm Tibbils $6. 8 pm. SAT Sept 11 Summer Saturdays Art Series, Perry NY. at the Turtle Hill Festival, Marcus Park, Honeoye Falls NY. FRI Sept 24th Daily Perks Coffeehouse,389 Gregory St,Rochester, NY. solo. I'll be playing Bernie Lehmann's guitars. Concert so special. Take a look at www.bobkleinphoto.com/go/guitar. Fri Oct 22 Daily Perks Coffee House, 389 Gregory St, Rochester, NY. Fri Nov 19 Daily Perks Coffee House, 389 Gregory St, Rochester, NY. K Nelson Monthly Series. with Al Power and Maria Gillard, 8-11pm $6. via internet at www.WMPG.org. 8:30AM to 9:30 AM. East Aurora, NY w/ Emery Nash [eclectic mixed bag]. 8 pm. 1/18 Sat. Canaltown Coffee Roasters, Main St, Pittsford. 8:30-10:30 pm. 1/22 Wed. The Press Room, 77 Daniel St, Portsmouth, NH. 9 pm-midnight. w/ guitarist Dennis Monroe--Renaissance to Modern. Cover. 8-11:30 pm. w/ fingerstyle guitarist Jerry Preston. Cover. 8-11:30 pm. 4 pm. $12.50 at door, $10 advance. Don't miss this one! 4/27 Sun. The Dolphin Striker, 15 Bow St, Portsmouth NH. 8-11 pm. 4/28 Mon. The Colonial Inn, Monument Sq, Concord MA. 5/24 Sat. Milestones, E. Main St, Rochester NY. Bob Dylan Birthday Party. Hosted by hunu? and featuring many localarea musicians. influence on American culture. 8 pm. 6/1 Sun. The Dolphin Striker, 15 Bow St, Portsmouth NH. 8-11 pm. with singer/guitarist Keith Harden. $6. 8-11:30 pm. 6/26 Thu. Center for the Arts in Natick, 31 Main St, Natick, MA. Oen Kennedy's open mic, Feature Act, 8pm. Mike Maffei, Stuart Shapiro, and Lynn Harrison. We'll be sharing the stage in a round-robin singer/ songwriter night. 389 Gregory St. Rochester 8 pm $7.00 cover $6. 8-11:30 pm. 8/17 Sun. The Dolphin Striker,15 Bow St, Portsmouth NH. 8-11 pm. with Maria Gillard. Round-robin singer/ songwriter night. Mon. Oct 20th Cantab Lounge on Mass Ave in Cambridge, Mass. Geoff Bartley's open mic. Feature Act at 10pm. Main Street, Victor NY. solo. 6:30-9:00 pm. 15 Bow Street, Portsmouth NH. solo. 8pm. Wed. Dec 3 Red Hook Brewery. 12/29 Sun. The Dolphin Striker, 15 Bow St, Portsmouth, NH. 8-11 pm . w/ Colleen Liggett, Sarah Long, & Maria Gillard. 12/3 Tue. Dansville Presbyterian Church, 3 School St, Dansville. Debbie Ponella, cello. Public invited. 7:30 pm. 11/16 Sat. Daily Perks Coffee House, 389 Gregory St.
A shared evening with bluesman Bob Halperin. $6. 8-11:30 pm. Polytechnic Univ., Brooklyn, NY. cover. 8 pm. 10/27 Sun. The Dolphin Striker, 15 Bow St, Portsmouth, NH 9pm. 10/18 Fri. Stimulence Coffee House, 3160 Main St, Buffalo. 9-11 pm. 9/27 Fri. Coffeebean Cafe, 3268 Main St, Buffalo. 9-11 pm. 9/14 Sat. South Bristol Cultural Center, 5323 Seneca Pt. Rd., Canandaigua. With Maria Gillard $8. 8 pm.